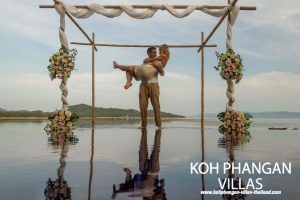 For those looking to having a wedding on Koh Phangan which has some exceptional beaches and exotic scenery with some spectacular views. Then you have come to the right place to find the perfect selection of luxury villas. Mermaid villa that sleeps 10 people is an excellent wedding venue villa right on the sea front, perfect location to get married. The villa has a walk way that crosses the pool to the wedding chuppa, this gives the effect of standing on water with the backdrop of Koh Phangan sea.Behind this villa lie 3 more villas that are all unique in their own way and serve the purpose to please and be part of the enjoyment of realizing you on the Island of Phangan. The four villas Serenity Lodge, Bay View, Island View villa and Mermaid villa are located near the small village of Shri Thanu on Koh Phangan. These villas are located on a peninsula and set on a large plot of land with its own private access to a small beach. The villas are around 5 minutes’ walk away from a small village called ShriThanu, where you find a selection of restaurants, bars, supermarkets and much more. The four villas all in close proximity of each other, meaning they are perfect for a large group of friends or a large family. The Villas are ideal accommodation for a large wedding party or gathering or party celebration. Although each villa has its own privacy they are all in touch with each other like neighbors. The large villa Serenity Lodge can host large parties to accommodate the persons staying in Bay View Villa and Island View Villa, Serenity Lodge acts and works well as the main base for all four villas. Families have stayed in all four houses that would meet up and be together at either Serenity Lodge or Mermaid villa which are both large villas with swimming pools, but when it comes to getting away from each other as families, the houses again work well, because they are able to get away and have the privacy they need. The houses in total can accommodate 34 people in comfort. Serenity Lodge and sleep 12 people in 6 double bedrooms and Bay View and Island View can accommodate 6 persons in each house with two double bedrooms and one single bedroom in each house and Mermaid villa can accommodate 10 people. If needed there is another option to accommodate another 2 persons in a small bungalow located next the villa Bay View, even bigger numbers we also have a neighbor villa who can another 6 persons, Lotus Villa. The Mermaid villa also has there own Tuk Tuk for rent that works nicely as wedding transport. We do not organize the wedding we only provide the villas, but we can recommend a local wedding organizer to organize the whole wedding event.Contact us below. A total capacity of 36 people can be accommodated comfortable on the Island of Phangan. We offer discounts if you book all the villas. Send us an email on the form below.